Make it safe for your child to talk to you. 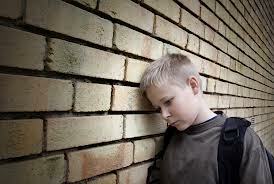 When your child comes to you to talk about a bullying experience, try to avoid having an emotional reaction. It can be scary for a child to hear that a parent is planning to lash out at a peer or parent. Calmly ask questions until you feel you completely understand the situation (Is it bullying, a peer conflict, or a misunderstanding?). Try not to leap into action right away, but instead focus on making sure your child feels taken care of and supported. Without blaming the bully, remind your kid that everyone has a right to feel safe and happy at school, and applaud the courage it took to take a stand and talk to you. Make a commitment to work with both your child and the school administration to resolve the issue. Teach your child to say “Stop!” or go find an adult. Research shows that most bullies stop aggressive behavior within 10 seconds, when someone (either a victim or a bystander) tells the perpetrator to stop in a strong and powerful voice. You, as the parent, can role-play an assertive response. Demonstrate the differences between aggressive and assertive and passive voices, as well as body language, tone of voice, and words used. If staying “stop” with an assertive voice does not work, teach your child to find an adult right away. Talk with your child’s principal and classroom teacher about the situation. Make it clear that you are committed to partner with the school in being part of the solution. Also emphasize that your expected outcome is that your child’s ability to feel safe and happy at school is fully restored. Ask the principal to share the school’s bullying policy, and make sure any action plan begins with notifying other teachers, recess aids, hallway monitors, and cafeteria staff so that everyone who comes in contact with your child can be on the lookout and poised to intervene should the bullying be repeated. Arrange opportunities for your child to socialize with friends outside of school to help build and maintain a strong support system. Try reaching out to neighborhood parents, local community centers with after-school activities, and your spiritual community. The more time your child can practice social skills in a safe environment, the better. Children who have friends are less likely to be bullying victims—and, if your child is bullied, friends can help ease the negative effects. Don’t go it alone. When supporting a child through a bullying situation, parents often discover previously unnoticed issues that may contribute to the child’s vulnerability. In addition to working with the school to help resolve the immediate issue, parents should also consider reaching out to physical and mental healthcare providers to discuss concerns about diagnosed or undiagnosed learning issues, depression, anxiety, eating disorders, etc. Encourage your child to stick with a friend (or find someone that can act as a buddy) at recess, lunch, in the hallways, on the bus, or walking home. Kids are more likely to be targeted when they are alone. If your child doesn’t have a friend to connect with, work with the school to help find someone to act as a safety partner. If cyberbullying is an issue, teach your child to bring it to the attention of an adult, rather than responding to the message. Many children fail to realize that saying mean things about someone on the Internet or through text messaging is a form of bullying. Make sure your child knows that you take cyberbullying seriously, and that you’ll be supportive through the process of handling the situation. Help your child become more resilient to bullying. There’s a lot parents can do to help “bully proof” their kids. Here are two biggies: first, provide a safe and loving home environment where compassionate and respectful behavior is modeled consistently. Second, acknowledge and help your child to develop strengths, skills, talents or other positive characteristics. Doing so may help your kid be more confident among peers at school. Provide daily and ongoing support to your child by listening and maintaining ongoing lines of communication. When your child expresses negative emotions about peers, it’s helpful if you acknowledge these feelings and emphasize that it’s normal to feel this way. After actively listening to the recounted bullying incident, discuss the practical strategies in this article together, especially the ones your child thinks will be most helpful. Follow Up. Even after your child’s bullying situation has been resolved, be sure to stay in touch with your child and the school to avoid a relapse of the issues. Keep the lines of communication open with your child, and learn the signs of bullying so that if another issue arises, you’ll be prepared to get involved early and effectively. Although a last resort, consider moving your child out of the current school or social environment. This may be a necessary action, and it sends the message that your child truly does not have to tolerate such treatment. Once established, social reputations among peers can be very difficult to eliminate. A fresh start in a new school environment may be a viable solution. Click on the link to read Our Young Children Shouldn’t Even Know What a Diet Is? This entry was posted on September 17, 2013 at 12:33 am and is filed under Bullying, Parenting. You can follow any responses to this entry through the RSS 2.0 feed. You can leave a response, or trackback from your own site. Reblogged this on Teen Talk.